When I first was offered to read a copy of No Sad Songs I was excited. I didn't really know what it was about except that it was a YA with a male protagonist set it in the 1990s. I, therefore, went in with low expectations, after all, I didn't know what it was about but No Sad Songs was an example of how to write an amazing YA book that everyone should read. So one of the high points of this book is definitely the writing, it was very well written and there were elements that just really added to the overall story. This was especially well illustrated with the personal essays in the book which were a great touch and allowed the reader to explore Gabe's character even more than we previously would have. As someone who really loves reading essays, Gabe's were really good at exploring his history. Thi book is also really short so to fit a story of this length and for it to be amazing is great in itself. I think that this is definitely a great thing about Gabe. As someone who reads a lot of YA, the male characters are normally real douchebags and don't tend to be good characters but this was completely the opposite with No Sad Songs. Gabe wears his heart on his sleeve and is a character that you want to root for as his past is rocky and you want him to do well in life. He came alive from the page and I just wanted to give him a massive hug. Gabe's story is based on his family which is so well done in this book. Morelli does an amazing job of exploring the family relationship between Gabe and his grandfather in this book that is heartbreaking and so great. This is especially fantastic in the grand scheme of the book as Gabe gives everything to his grandfather so seen his evolve in the plot is heartwrenching. The book also focuses on Alzheimer's and was done really well and I would love to see his being tackled in the book. With this family relationship being the core this was different to most other YAs and I want to see this done more. This book was just so good! 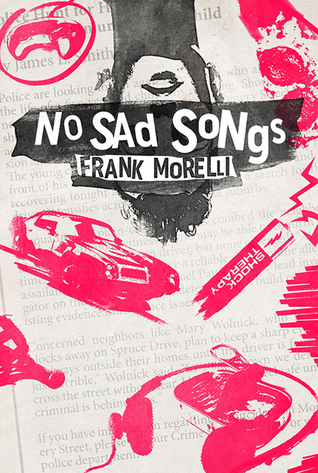 No Sad Songs is an excellent YA book that will have you hooked emotionally on the characters and the journeys that they take.